FLOATING in a dark, soundproof pod is set to become the next big health trend in Perth, according to the owners of new Wangara business Float & Restore. Stu and Dawn Gee, of Gnangara, started the business in June after falling in love with floatation therapy, also know as sensory deprivation, at a Perth centre. Mrs Gee said it de-stressed her husband and aided his recovery from sports injuries. “It was helping him with everything. We just kept going back and loved it and thought, ‘Why not open one up here’?” she said. The couple own an engineering business upstairs and when the space below came up for sale at the end of last year, they jumped at the opportunity. 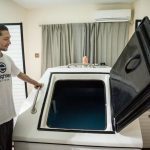 With help from friend and employee Jim Hughes, the trio now operate Perth’s largest floatation therapy centre, which offers four modern Dreampod tanks and a massage service. 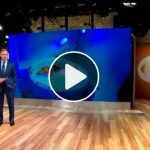 The tanks are filled with warm water and 500kg of Epsom salt, which allows people to float effortlessly in a light and soundproof environment. Discovered in the 1950s, Mrs Gee said floatation therapy enjoyed recent popularity when American actor/comedian Joe Rogan started advocating it about five years ago. “Since then, it’s just gone crazy because people have started to discover the benefits from it more and more,” she said. Float & Restore’s first customer was Mrs Gee’s friend, who suffers from fibromyalgia and relies on crutches. “She went in the tank and she came out without her crutches and she walked,” Mrs Gee said. In the first week of opening, the business catered for more than 40 clients and received another 100 bookings from a variety of people, including athletes, FIFO workers, businesspeople and pregnant women. “It’s meant to double recovery time and for every hour it’s meant to be three to four hours sleep,” Mr Gee said. They have also hired 20-year-old Damian Charles, who started using float tanks six months ago. “When I float I’m more calm and more at peace with everything all the time,” he said. Two more centres are due to open in the northern suburbs in coming months, in Joondalup and Greenwood.